Join us this Friday, October 20th, 2017 to feel the impact! An intimate evening of piano quartets, and to hear more about NYCI's upcoming 2018 International Women Conductor's Workshop and the impact of the first one that happened in March of 2017. Join us for light refreshments starting at 7:30pm, and the concert at 8:15pm at the Rehearsal Hall at Opera America, 330 7th Ave, 7th floor, New York, NY 10001. 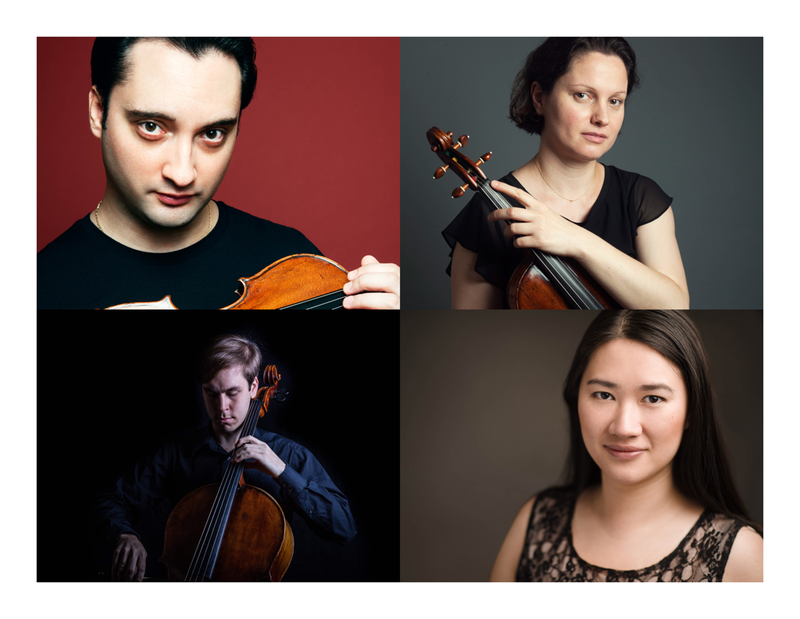 Dynamic musicians Artur and Eszter Kaganovskiy, Benjamin Larsen, and Mun-Tzung Wong will bring the Mozart E-flat major and Brahms G minor quartets to life. ​To support NYCI's Women Conductor's Scholarship Fund, please visit here. Born in Moscow, Russia, in 1986, Artur Kaganovskiy started playing the violin at age three and, with guidance from the famed Isaac Stern, he quickly established himself as a leading personality in the violin world. Winner of the Waldo de Mayo International Violin Competition and recipient of the prestigious Fritz Kreisler, H. Gilbert and Joseph Fuchs Awards, Mr. Kaganovskiy is a graduate of The Juilliard School from where he holds a Bachelors and Masters Degree in Violin Performance. His primary teachers include Grigory Kalinovsky, Lewis Kaplan and Masao Kawasaki. Mr. Kaganovskiy made his Carnegie Hall debut, performing Elgar’s Violin Concerto at the Stern Auditorium in 2007 under the baton of David Gilbert. Since then his rapidly growing solo career has taken him to China, all over Europe, Ukraine, Canada, South and North America and has collaborated with such artists as Pinchas Zukerman, Grigory Kalinovsky, Zachar Bron, Joseph Silverstein and Michael Tree. In 2015, Mr. Kaganovskiy was prenominated for the Grammys as best violin soloist with David Chesky’s Joy and Sorrow Album. His recordings of the Brahms and Tschaikovsky Violin Concertos recorded with the National Symphony of Ukraine will be released by Centaur Recordsin the Fall of 2017. His recent performances include his debut with the BOS Orquesta Sinfonica de Bilbao on behalf of Bilbao Puerto de Arte with Maestro James Newton Howard, featuring Mr. Howard's two Suites for Violin and Orchestra from the films Defiance and The Village. His upcoming performances include two tours in 2017 and 2018 with the Salzburg Chamber Soloists all over Spain and in 2018 Mr. Kaganovskiy will be joined to perform the Bach Double Concerto with violinist Schlomo Mintz. Besides his extensive solo career, Mr. Kaganovskiy has tought masterclasses among others at Miami State University, Guadalajara University and is the Artistic Director of the “Kaganovskiy- Helfy” ESRA Foundation program in Budapest, teaching and helping young talented violinists from difficult social circumstances. Some of the donations include violins and bows made personally by Mr. Kaganovskiy himself. Mr. Kaganovskiy performs on a 1704 Alessandro Gaglianoviolin which was part of the Metropolitan Museum’s “ Guitar Heroes” exhibition in 2011. New York City based concert violist, Eszter KAGANOVSKIY is member of the Kaganovskiy Duo, World Chamber Virtuosi and Memling Ensemble performing regularly with members of the Metropolitan Opera and musicians of Lincoln Center. Eszter has performed at the Berlin Philharmonic Hall, Chicago Symphony Center, Lincoln Center, Zankel Hall, and Weill Recital Hall at Carnegie Hall. She is a former member of the Civic Orchestra of Chicago, training orchestra of the Chicago Symphony, and has performed under such conductors as Pierre Boulez, Bernard Haitink, Seiji Ozawa, Esa-Pekka Salonen, Kent Nagano, Sir Mark Elder, Cliff Colnot and Emil Simon among others. Mrs. Kaganovskiy holds a Bachelor’s Degree from the Gheorghe Dima Music Academy, Cluj-Napoca, Romania;Masters Degree from Western Illinois University, Macomb, IL, United States; and Performance Certificate from DePaul University, Chicago, IL, United States. A recipient of many awards and scholarships, she had the President’s Award at Western Illinois University and the Viola Award at DePaul University. Her major teachers include Rami Solomonow, Daniel Panner, Sorin Gherbanovschi and Derzsi Albert. She has been featured in masterclasses with Lawrence Dutton, Csaba Erdélyi, Christian Euler, Cyrus Forough and Yehuda Hanani. She has performed at the Bowdoin International Festival in Bowdoin, Maine; at the Bayreuth Young Artists Festival in Bayreuth, Germany, at the International Bachakademie in Stuttgart, Germany and at the VerbierFestival in Switzerland. As a chamber musician, she has collaborated with many of the world’s top artists, comprising of Ilya Kaler, Robert Levin, Viktor Tretyakov, Alexander Fiterstein, Alexander Peskanov, Mark Peskanov, Rami Solomonow and Anthony Newman. Recent performances include performances of the Bruch Double Concerto with Artur Kaganovskiy violin and Lavard Skou Larsen conducting the Transylvania Philharmonic Orchestra in Cluj- Napoca, Romania; Sinfonia Concertante with The Spectrum Symphony of New York, Telemann Viola Concerto with the HigienoRuvalcaba Chamber Orchestra in Guadalajara, Mexico; a Kaganovskiy Duo tour of Tuscany, Italy; Mozart Sinfonia Concertante with the Moldovan Chamber Orchestra in Moldova after a personal invitation from the US Ambassador of Moldova, William H. Moser, to perform at his residency, resulting in a performances at the Regina Viorii Festival of solo and chamber music works, and chamber concerts at Yale University, Lincoln Center and Carnegie Hall. Her popular music appearances include performing with Imagine Dragons on Saturday Night Live. ​Mrs. Kaganovskiy performs on a 1737 Carlo Tononi viola. Known for the energy he brings to the stage, cellist Benjamin Larsen has forged a reputation as an avid chamber musician in the New York City area. His knack for adventurous programming comes through in his work as Artistic Director of the series, Concerts on the Slope, and in the projects that he spearheads, working with some of today's most notable composers, including Robert Sirota, Reena Esmail, Tania Leon, Ke-Chia Chen and many others. In 2016, Larsen launched a project with flutist Martha Cargo, "Pieces of Eight," which is comprised of eight commissioned works by eight different composers for Flute-Cello duo. The project promotes the genre, and provides the opportunity to work closely with composers of various generational and cultural backgrounds. He has also performed alongside members of the Emerson, American, Chiara and Tokyo quartets, as well as Daniel Epstein, Vicky Chow, Ian Rosenbaum, Eriko Sato and Linda Chesis.Mr. Larsen is a graduate of Manhattan School of Music, where he was the recipient of the Hans and Klara Bauer Scholarship, as well as the 2011 Pablo Casals Award. His past mentors have included Julia Lichten, David Finckel and Eric Dahlin, as well as lessons with Marta Istomin and Bonnie Hampton. He spent a year playing with the band, The Left Banke, and attended summer festivals including Pacific Music Festival, Norfolk Chamber Music Festival, Music@Menlo, and Castleman's Quartet Program. In addition to his busy performance schedule, he holds a private teaching studio in addition to faculty positions at Music School of Westchester, DZ Strad Violin Shop and Florentine Music School. He plays on a 19th century anonymous cello. Hong Kong native, Mun-Tzung Wong, the founder and director of New York Conducting Institute, is on staff at the Manhattan School of Music. A collaborative and solo pianist in New York City, she has appeared on WQXR and performed at venues such as Carnegie Hall, Symphony Space, Alice Tully Hall, Steinway Hall and Lincoln Center. She has worked with maestros Kurt Masur, Philippe Entremont and George Manahan. She joined Joan Dornemann's International Vocal Arts Institute as a staff pianist and coach two years ago. She has been engaged with St. Petersburg Opera Company in Florida as the principal répétiteur since 2015. Last summer, she was involved with New Rochelle Opera and Regina Opera as the assistant conductor. This May, she was the assistant conductor at a new project on Italian operas curated by Sergio Pellegrini of the orchestra dell’Opera di Parma. Starting this June, she was appointed as the assistant artistic director and the resident opera coach at the Hot Summer Nights Festival with the Missouri Symphony Orchestra. As a teaching artist, Miss Wong maintains a private instrumental and vocal coaching studio in New York City. She studied conducting with maestros including Larry Rachleff, Don Schleicher, Kirk Trevor and Paul Nadler. As an emerging mezzo-soprano, she has recently appeared as a concert soloist at performances of the Mozart Requiem, Mass in C minor, Vivaldi Gloria, Bach Magnificat, St John Passion and Duruflé Requiem, and will be performing Händel Messiah in December 2017.